A quiet day on Feb. 13 had us excited about a half day of hiking in a state forest new to us. We ventured out to explore the woods of Black Rock State Park and the Mattatuck State Forest in Watertown, CT.
We parked at Black Rock State Park and quickly exited this part, crossed the street and begin hiking on the Branch Brook Trail. 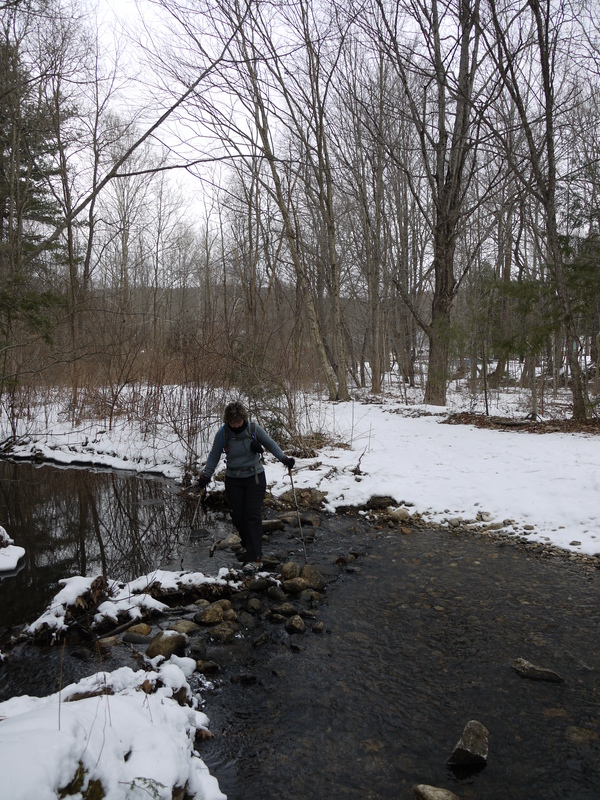 Our first adventure was crossing the Branch Brook. The fun really began once we set foot on the Mattatuck Trail. Great little path that went up, down and around the Mattatuck State Forest. 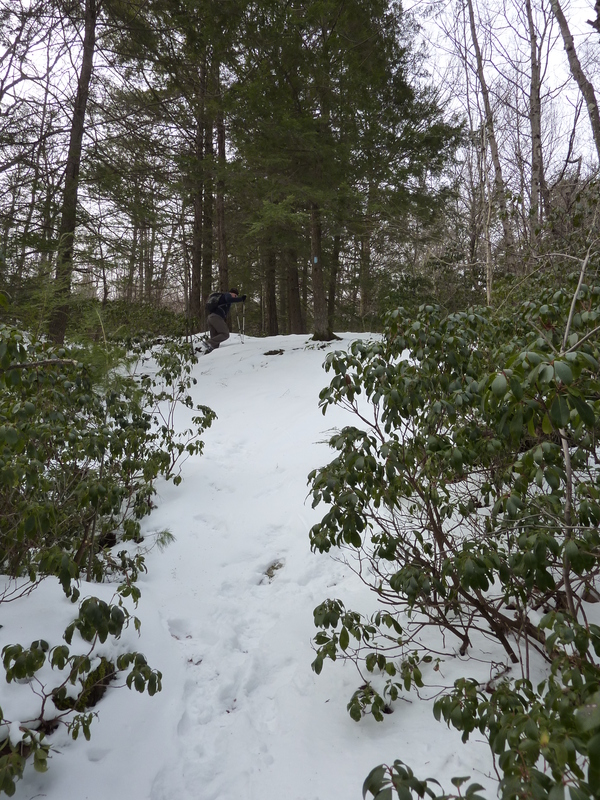 We faced some steep sections going up, slippery snow made it fun and a bit of challenge. We tried valiantly to keep our footing and momentum going up these little challenges. After this we found the past of the Leatherman’s Cave. In the 1800s a man wandered a 365 mile circle between CT and the Hudson Valley. This cave was one of his stops and rather sad to say today, it seems to be a party spot. Being little helped.I was able to scrambled over and between the rocks that made up this cave like area. Mike unfortunately had to turn into a contortionist to squeeze through some areas of rock. It made me laugh watching him maneuver himself to get out. We had a great view after an uphill battle with a snow packed trail. This spot was at 780 feet. The sound of cars on route 8 drew our eye towards the highway, but we looked beyond and saw the hills roll gently onward. 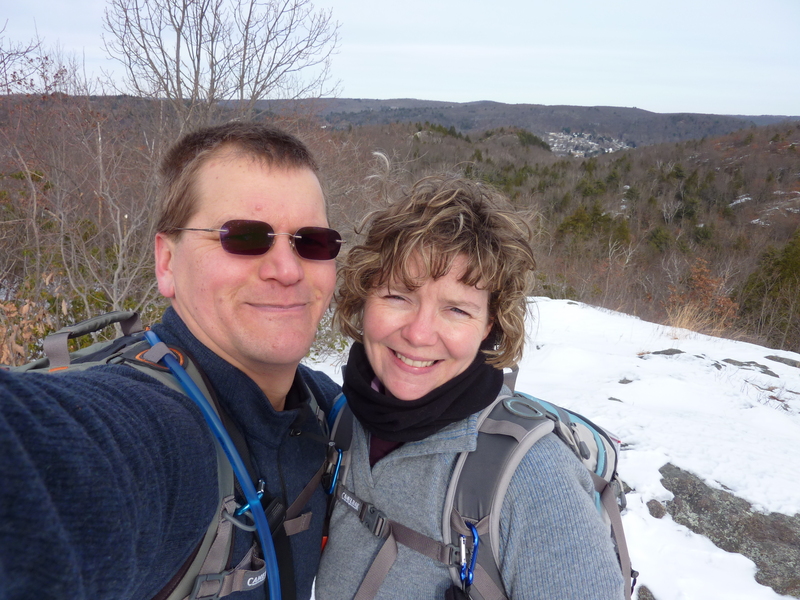 We decided this was our Valentines day hike and had fun taking a couple photo. After that we strolled down, crossing Route 6 and Bidwell Hill Road into Black Rock State Park. Here the trail became wider and well-traveled. We came across a few people out walking their dogs in this park. We decided to head up to Black Rock at 790 feet. I was pretty beat and this continuous uphill was slow. What kept me going was the thought of food, chocolate hearts and other goodies that awaited us. Little did I know that Mike, had cut our pepperoni slices into hearts. He topped me on that Valentine’s surprise. We sat on the ridge and enjoyed the view. It was a short stroll down and to the car. Black Rock State Parks seems to be an active place in the summer and I’m glad we hiked it in the winter. I think to hike it in the spring it would be a very wet hike. Until the next hike in the woods…..
the small details: It was a 5.4 mile hike taking us four hours, but one hour was rest and picture-taking. 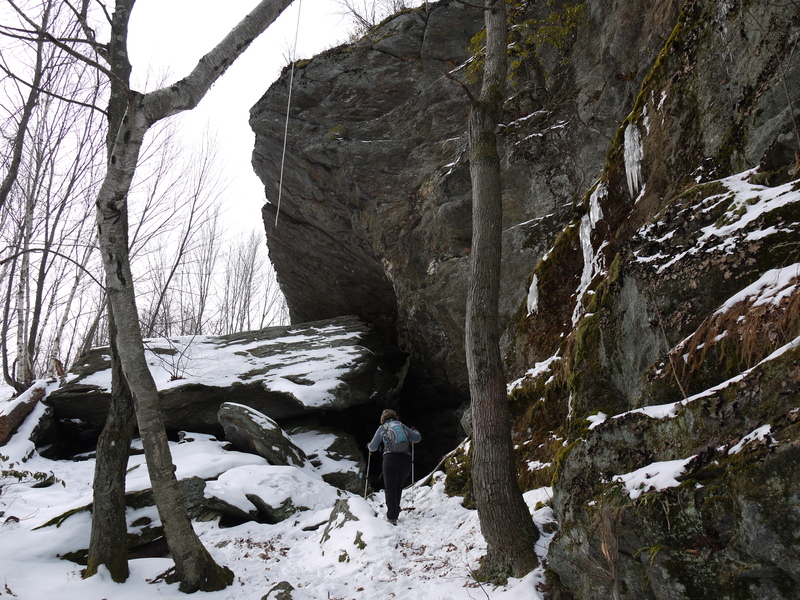 There was some rock scrambling, tight fits and a few sections that went straight up requiring some fancy footwork in the snow and the use of trees to hold on to. I would rate this a fairly medium hike, no scary sections that were cliff hangers or technical sections.